I want to say a big thanks to our partners in Del Rio, Acuna and Mazatlan for a fantastic trip to the port city on the Pacific Coast of Mexico. Although the city is home to beautiful beaches, our time in Mazatlan, Sinaloa was filled with meetings with business and government officials promoting the Ports to Plains Corridor and the connection with Mazatlan. There are many great things to report from the trip. First, Sinaloa is a great fit with the rest of the PTP region. The state is the breadbasket of Mexico producing a large share of the country’s food. TMAZ, the port operators as well as the Port Authority gave us a great tour of the port, which is growing and has the potential for further expansion. Business and economic development officials are also excited about the partnership with PTP. I specifically want to thank the leaders of Del Rio and Acuna for arranging this trip. These two cities have long been strong advocates for Ports to Plains, and their initiative to schedule the meetings, as well as make the approximately 12 hour drive to see the conditions of the corridor though Mexico in its entirety are admirable. Of course anyone who has attended our previous annual conferences hosted in Del Rio and Acuna know what a great job they do with everything. 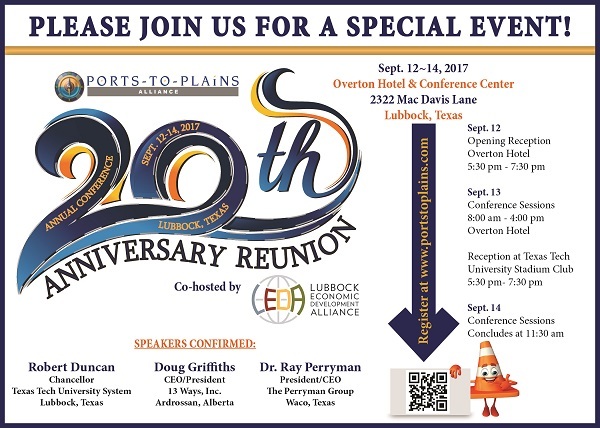 Finally, I want to encourage you to make plans now to attend the 20th Ports to Plains Annual Conference September 12 – 14 in Lubbock, Texas. Registration and hotel deadlines are fast approaching and you do not want to miss this great event. Canadian Rotarians Highway to Mexico program continues.. The founders of Ports-to-Plains discuss their vision for this project, how they overcame obstacles, and their advice for future success! ONLINE REGISTRATION AND ROOM DISCOUNTS END THURSDAY 8/31! For the past 16 years, the Rotary Club of Grande Prairie has been sending older model ambulances, fire trucks, and rescue trucks to Mazatlan and its surrounding areas. The eight-day journey is called Highway to Mexico and covers nearly 5,000 kilometers. In April, the club collaborated with other rotary clubs to send a convoy of four ambulances, two rescue trucks and one fire truck to Mexican cities clearly in need. “Prior to our delivery for Culiacan with a population of a million they had four ambulances. So imagine needing an ambulance, calling 911 and hearing that ‘we’ve dispatched paramedics, they’re now cycling towards you’ because paramedics down there work on bicycles,” said Kris Podolski, a Rotarian member and one of the drivers for this year’s delivery. By having the paramedics go on bicycles to a scene first, they can not only get there faster but can then send word if an ambulance is truly needed. Therefore, it doesn’t waste necessary resources, explained Podolski. “… That is how big of a shortage they have in a city of one million people,” he said. Podolski noted the lack of fire hydrants in the cities is also troublesome. “In Mazatlan, a community of I believe approximately 400,000 people, I was told they have 13 fire hydrants. So there is not even access to fire hydrant resources to help fight the fires. So that is why they do need the pump trucks and the water trucks,” said Podolski. “Of the vehicles delivered, over 85% of them are still on the road today. Most of them are more than 25 years old, which goes to show how well they’re looked after”, said Allan Kuechle, co-ordinator of Highway to Mexico. He added people in Mazatlan are proud to be able to have the vehicles. A top aide to President Trump told reporters Aug 15 that the administration plans to first pursue a tax reform plan in Congress this autumn, then turn to the long-promised infrastructure investment plan. Gary Cohn, director of the president's National Economic Council, said the infrastructure plan would "come on the heels" of a tax overhaul, Politico reported. "We hope it's this year," he added. While the president and others in the administration at times this year said they were close to introducing a project investment proposal for Congress to consider, the administration has so far offered only a few details and Congress has found its agenda clogged after numerous attempts to pass health care legislation. Cohn's remarks to reporters, made at New York's Trump Tower where the president held a press conference after signing an executive order to speed environmental reviews and permitting for planned projects, indicated that the infrastructure plan might be pushed into 2018. "We need to get taxes done between now and Thanksgiving. We need to get infrastructure going. 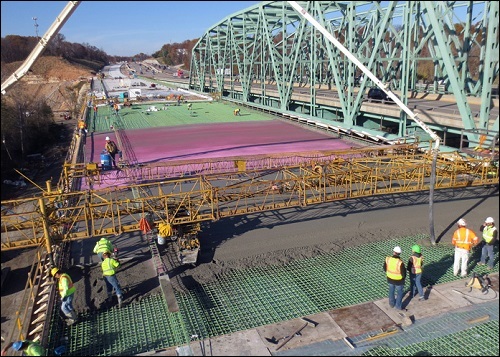 As soon [as] tax comes out of the House and goes to the Senate, we'll put infrastructure in the House." ALLIANCE, Neb. The Heartland Expressway Association had their annual meeting to discuss the process of the highway. 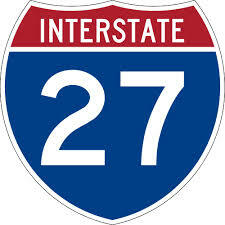 The Heartland Expressway is a federally designated, high priority corridor. When completed, the Heartland Expressway will provide multi-lane, divided highway access between Rapid City, South Dakota and Denver, Colorado through Alliance and Scottsbluff, Nebraska and Brush Colorado. “At this point, we’re finally at the point where we are starting to see some construction but that is from the result of many people’s long years of working towards this and having the vision to move forward on this project,” said Annie Folck, Planner Coordinator for the City of Scottsbluff. 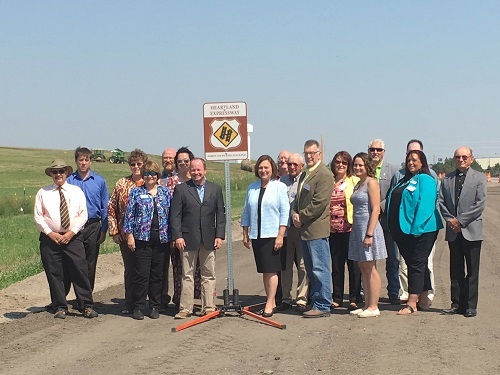 The key speakers for the meeting included US Senator Deb Fisher, HEA Chairman Lane Danielzuk, Vice of Operations Joe Kiely and NDOT District 5 Engineer Doug Hoevet. The meeting included an unveiling ceremony of the new Heartland Expressway road sign. “We are excited that the portion south of Alliance is under construction right now and we’re excited for the portion that is east of Minatare will be under construction, I believe starting in 2024,” said Folck. 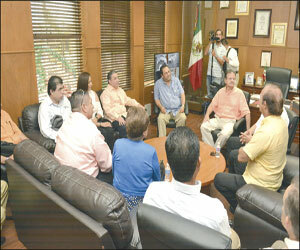 Mazatlán, Sinaloa.- In order to create trade opportunities, mayors of Ciudad Acuña, Coahuila, and the city of Rio, Texas, met with the mayor of Buenos Aires, Fernando Pucheta Sánchez. Roberto Garza, Mayor of the city of Rio, Texas, after the meeting stressed that they are ready to work together and push different strategies. 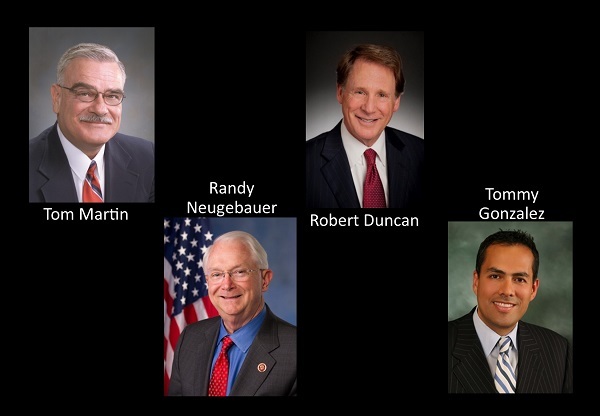 "There are many opportunities here for commerce, to improve the economy of our people in Rio, Texas. 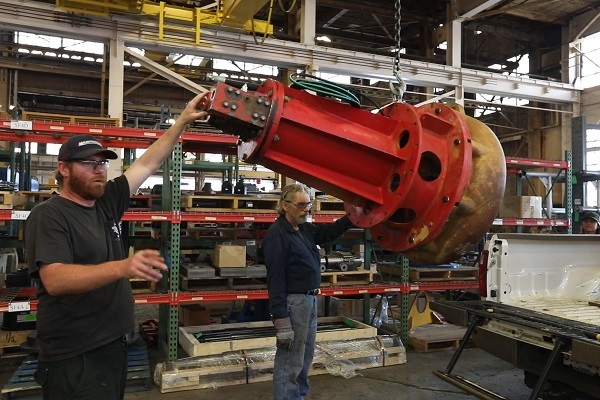 We are well-known for that and products coming from Asia are coming mainly from Nuevo Laredo, El Paso, but to us in the mere half of the state of Texas it would be more convenient if they chose us." he said. He indicated that there are more than 60 maquiladoras in the villages, with experience in the commercial traffic, where they estimate to build a second bridge that is dedicated to this commercial activity. "In that we are, that is convinced to some businesses to be able to command by that new bridge. The main reason is the economy, there is much art and culture in our area that would also attract the tourist side. We will have more meetings with more mayors in the way through their villages to connect." he said. Also included in the meeting were Evaristo Lenin Pérez Rivera, mayor of Ciudad Acuña, Coauila, as well as the president of the Automotive Cluster Lagua-Durango-Coahuila and officials of the municipality of Mazatlán. The representatives of the Cluster and the mayors agreed on the development that Mazatlán is experiencing and the importance of the port being integrated into the cluster to encourage the movement of goods through these cities. For his part, the mayor of Mazatlán emphasized the importance of closer relations between these cities, so he issued instructions to soon formalize the relationship of collaboration between them.